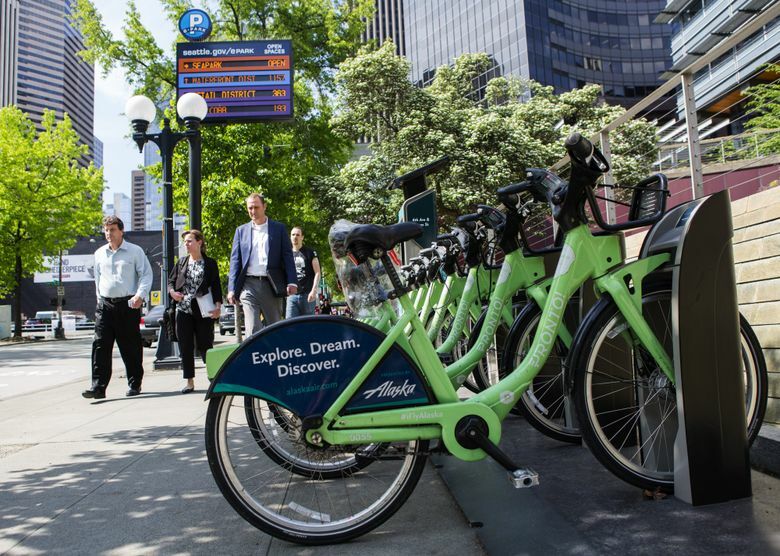 Pronto, Seattle’s beleaguered bike-share system, will close for good on Friday. City crews will begin taking down the stations and removing the bikes on Monday. They will go into storage as officials look for other cities interested in buying the equipment. Seattle’s beleaguered bike-share system is not long for this world. Its last day of operation will be Friday. After a weekend in purgatory, work crews will begin taking down and packing up the program’s 54 stations and 500 bikes on Monday. That process will last about two weeks, the Seattle Department of Transportation (SDOT) said. The equipment will be put into storage as SDOT looks for other cities that may want to buy it. Pronto stations that were on the street (as opposed to a sidewalk) will be replaced by whatever parking type is on the rest of the block while SDOT considers future uses. People who had paid fees for Pronto annual memberships will be reimbursed for the time remaining on their contracts after the March 31 shutdown date. SDOT has spoken with cities including Spokane; Pittsburgh; Tulsa, Oklahoma. ; and Pioneer Valley, Massachusetts, about buying the Pronto equipment, Rowe said. Because the equipment is partially city-owned and partially grant-funded, and because the needs of other cities are uncertain, there’s no estimate for how much it might be sold for, Rowe said. Bike shares are booming in the United States. In 2010 the nation had only four bike-share systems, which accounted for about 300,000 total rides, according to data from the National Association of City Transportation Officials. Last year there were 55 bike-share programs and more than 28 million total rides. Total ridership nationwide has increased nearly 60 percent since Pronto launched in 2014. But it’s been a different story in Seattle. Pronto launched in fall 2014 with high hopes, a $2.5 million private sponsorship and $1.75 million in state and federal money. But it had to deal with a challenging environment — a hilly, rainy city with a mandatory helmet law and a downtown area clogged with traffic and with few protected bikeways. Within a year, city officials were pushing to take over the bike-share system, which had been owned by a nonprofit. Scott Kubly, the city’s transportation director, argued that a city takeover would allow Seattle to build a bigger, broader network that would attract more riders. In January 2016, the city was told that Pronto was insolvent and would shut down if the city didn’t buy it. The city complied in March 2016, buying Pronto for $1.4 million. Kubly, in his previous job, had been president of the company that operated Pronto. He later admitted to an ethics violation and agreed to a $10,000 settlement for failing to get an ethics waiver or recuse himself from the city’s launch and purchase of Pronto. After the city’s purchase, Pronto never significantly expanded its network. It still had the same number of bikes it did at its launch and had added only four more docking stations. Still, as recently as December, the city seemed ready to make significant new investments — by buying a whole new fleet of 1,200 electric bikes and 100 new docking stations — to transform the system. In January, Mayor Ed Murray announced that he was changing course. He scrapped Pronto and said the $3 million that had been budgeted to the bike share would be used for pedestrian and bike projects such as improving crosswalks at schools and adding bike lanes. “I remain optimistic about the future of bike share in Seattle,” Murray said in January, suggesting it still could be possible for the city to host a private or partly private system.